It is impossible for me, having been exposed to The Birdcage first, to not compare the original and the remake. Almost from the word go I sensed a great disparity between the two films even though the remake ended up being and uninspired copy and paste writing job. The first thing that lends itself to creating a different tone is the music composed by Ennio Morricone. The music in The Birdcage by Mark Mothersbaugh and Jonathan Tunick is forgettable seeing as I’ve seen the remake three or four times and can’t remember a single note while I’ve seen the original once and can still remember Morricone’s score. Ennio Morricone’s gentle music takes us into a world that we shouldn’t be afraid of. The key word to thinking about his music is sensitive. It exudes softness, tenderness which is aped by the action and the actors who are not ridiculous characterizations but with real people and real emotions. Due to the fact that all scenes include practically the same dialogue it is a huge complement to Ugo Tognazzi and Michel Serrault that they made their characters more three-dimensional and real than Robin Williams and Nathan Lane. The American interpretation of this film is also vastly different than the French. Due to the fact that this film deals with homosexuality, which is a topic that still is tinged with taboo here Americans have to turn the film into a farce of a farce. In other words the movie has to be ridiculously over-the-top to be accepted. The pathetic part of the remake is that it perpetuates stereotypes and while the stereotypes do exist (for how do stereotypes come into being?) by merely making them more human we can see beyond a stereotype to the person portrayed. A perfect example of this is the opening scene. They are the same in both films. Renato (Armand in the American version) tries to get Albin (Albert) onto the stage to perform his act. In the American version Nathan Lane makes his character seem like a whining melodramatic pain-in-the-you-know-what because of this the scene is very funny but emotionally superficial. In the French version practically the same dialogue is spoken but because of the way Michel Serrault delivers his lines and because of the more subdued expression he has on his face the words take on weight. They have meaning they come across as real concerns for the relationship as opposed to a paranoid delusion and an excuse not to go on stage. It made me believe the affair was a possibility all over again and made me forget about the son and his impending marriage. The deception of the possibility that Renato is having an affair is aided by the son’s appearance. In the American version he was clean-cut and Ivy League here the son in full 1970s look, long hair included. La Cage aux folles in 1978, even in France, was a more progressive film depicting a gay relationship, a gay couple who had raised a son and how the couple still had to pretend in certain social situations while longing to be completely honest. By 1996 in the United States homosexuality was not such a hot topic of controversy yet a slapstick-esque context is the only way the mainstream will be able to accept gay characters. Dramas about homosexuals are sole dominion of the art houses. This is a film that does something very difficult to do. It takes a situation that is rich with comedy and imbues it with humanity and warmth. Making this a layered comedy which is something rare regardless of the country the film is made in. La Cage aux folles is a really fun film which takes a serious look at human relationships and society’s perception of people’s lifestyles without putting any one down or getting preachy. It’s a lot of fun. This film exemplifies many things I like to see in films but rarely get enough of. Often times in Hollywood films we get interesting concepts that never live up to their full potential. In The Vanishing we get a film that forgoes cheap thrills and pace to examine the characters involved in a very thought-provoking way and it manages to achieve a greater level of creepiness than most American films would. After having first watched this film I was looking around in all directions as I walked around and here’s why: One of the first things that strikes you is the music. There’s a deep bass and it doesn’t overly-anticipate the moment but still highlights the film with an overtone of foreboding which is just magnificent. And as this word could apply to the film as a whole it is especially significant in the antagonist; subtlety. Played by Bernard-Pierre Donnadieu, Raymond Lemorne is a great villain because he’s believable, well defined and most frighteningly in the end we even understand him and worse yet he seems real. Another thing this film has going for it is the way the film isn’t told chronologically. We first see the vanishing and the desperate search in the first few hours, then we are introduced to Lemorne, peg him as the man, see his routine and see that three years have gone by. All throughout the film we will skip through time for large periods. The disappearance of Saskia will be filled in over and over again until the actual events are seen through their entirety. And the last piece only falls into place at the very end. Amazingly, with this unusual structure the film is not hard to follow in the least and certainly much more intriguing then the conventional linear plot we’re used to seeing in the United States. The ‘reality’ of these events are set up in many way by director George Sluizer. Firstly, there was great used of subjective camera and the ‘Zero Degree Style’ common in the States is completely abandoned. The other touches of reality come as we delve into the two main characters: Rex and Raymond. Raymond, the criminal, is first only seen in a very one-dimensional manner. We see him as a fraud who seems to be scoping out the store for possible victims. Then later in the story we see him begin to formulate his plan, to perfect it over and over again. The one scene where we see him as a biology teacher is just enough to show us that these people could be anyone and can fool you so easily. There is also the scene where Rex is waiting for him at the restaurant. Rex says he’s waiting for Mr. Montmejan and that happens to the waiter’s name. The commonness of the name adds profound statement about the plausibility of the plot. The tension of the film is also aided by McGuffins, or botched attempts by the professor. In one scene we see him pick up a young girl, we know already that him locking the door is where he makes his move and poisons the girl but it’s his daughter. He also runs into a former student of his and tried to get her in his car and we see a chilling example of how he may have escaped justice for so long for even when someone calls him on it their content to just get away. There’s also the scene where Raymond is out of focus in the background as Rex looks around for him. This is also another great scene of anticipation. Rex’s relationship with Lieneke and also his quest are also quite believable. He reaches a point where all he seeks to know is the truth. The Vanishing is also greatly helped by some really good dialogue. The image of the Golden Egg as related by Saskia through her dream sort of predestines the film in a way as we’ll see they both have the same fate, however, that is not a fault of the film. I firmly believe that there are only so many ways a story can end and it’s not how it ends that always matters but how you get there. The Vanishing is a toned down psychological thriller that’ll get under your skin. It’s a film that’s had my imagination captive for a week. It’s not only a prime example of a psycho-thriller but also of well-structured and executed character studies. It’s a great achievement. Firstly, it must be said that as simple as it is a test of the greatness of Bicycle Thieves is how much can and has been written about it. This piece, however, is meant as an introductory piece to the film in hopes that more people will discover this cinematic gem. This is not an in depth examination or an in depth film theory piece. For that kind of examination I could not do better than to direct you to the companion booklet that comes with the Criterion release. 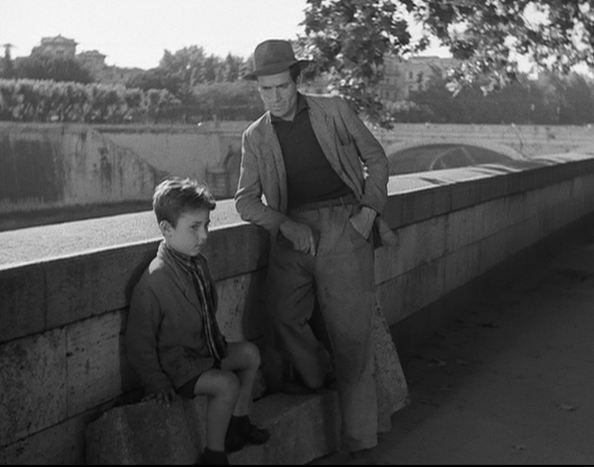 Bicycle Thieves is all that is good about Neorealist cinema in one tidy story. It is naturalistic acting, practical locations and a simple yet utterly compelling storyline. The film sets up its dramatic problem instantly. Antonio is assigned work but needs a bicycle or he won’t get the job. He does manage to get it out of hock but his troubles aren’t nearly over. What is most effective in this film is that in following Antonio on his quest we become fully immersed in it. We identify with him because we know the significance of the bike and why he needs it. What’s more is that we can see the extremes he goes through and can relate when he is pushed past his breaking point. In his failing we can see why he has reached his last resort. In this way Bicycle Thieves becomes the perfect tragedy because our protagonist can see how far he fell and can wonder what he could’ve been thinking without ruining his entire life. The tragedy is ultimately left for us to examine. As we know there are many more stories like it playing themselves out everyday. By making the tale small and not grandiose it’s easier to see how it could be you.